One of my roommates and I dressed up for Halloween this year in a funny Donald Trump costume. We were Donald Trump on roller skates. The theme for the costume was based off of his Presidential Candidate slogan, except we decided to make a play on the words. 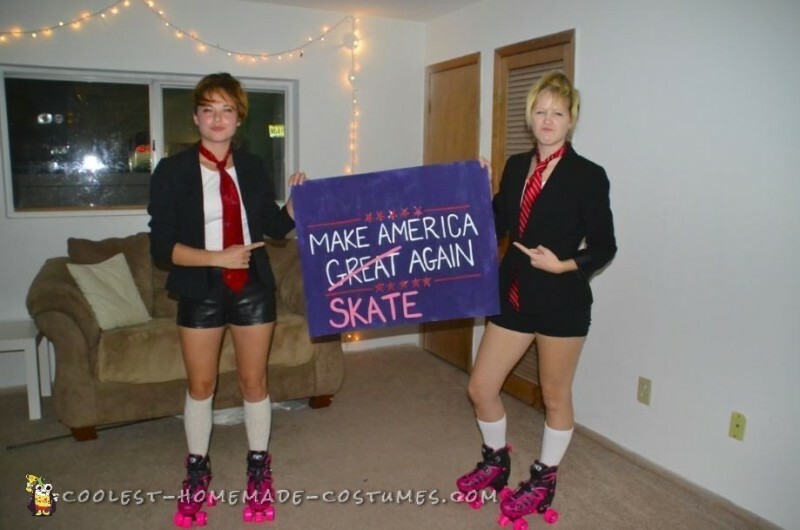 So we entitled our costume “Make America SKATE Again.” We were able to come up with this idea since the election is coming up soon, so there has been a lot of media surrounding the candidates. We wanted to put a fun spin on just a typical costume of Donald Trump. The creation of the costume itself wasn’t too difficult for us. 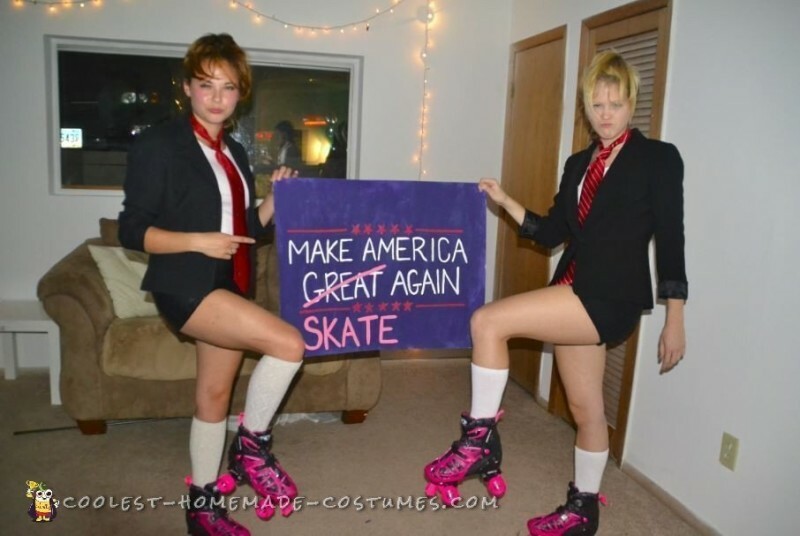 It only required a white shirt, blazer, red tie, high socks, and of course the roller skates themselves. We topped off the outfits with a handmade sign displaying our own personal slogan of the night. Our costumes had a lot of good reactions from others, as people loved the play on words! People also loved playing along with us as we tried to stay in character. I would probably have to say that remaining in character was one of the hardest parts about the night. My roommate and I wanted to really go for it this year and pretend to be Donald Trump all night but sometimes it was very difficult. However, it was made it easier when other people would joke along with us and help keep us going and encouraged! All in all the costume was a really fun one to do. Not only are we both fans of puns, but it was also just a lot of fun getting to glide around on some roller skates all night long. We both managed to escape the night without too many major wipe outs, so we also consider that to be a great success. Perhaps even the biggest accomplishment of the night for us!